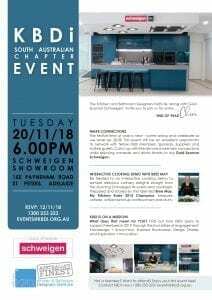 The Kitchen and Bathroom Designers Institute, along with Gold Sponsor Schweigen, invite you to join us for some… end of year cheer! The festive time of year is near – come along and celebrate as we wrap up 2018! This event will be an excellent opportunity to network with fellow KBDi Members, Sponsors, Suppliers and invited guests. Catch up with friends and make new connections while enjoying canapés and drinks thanks to our Gold Sponsor Schweigen. Be treated to an interactive cooking demonstration to sample delicious culinary delights straight from the stunning Schweigen IN ovens and cooktops. Prepared and shared by the talented Bree May, My Kitchen Rules 2014 Champion, bespoke caterer, artisan ketchup craftswomen and Mum. KBDi IS ON A MISSION! What does that mean for YOU? Find out how KBDi plans to support Members in 2019 through the four pillars of engagement: Knowledge + Know-How, Business Bootcamp, Design Diaries, and Inspiration + Innovation.